Those that have been asking after hearing about it, here it is! The Actual play podcast for the Pocket Mimic Podcast, hosted by DM Vince, and his local face to face gaming group. 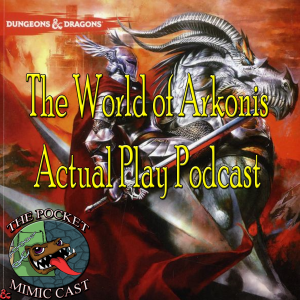 Listen in as Vince weaves the strange tale of the World of Arkonis, a homebrew world with wacky NPC characters, mystery and people to save! The cast of characters is a bunch of characters! We all are friends in real life, so we don't take things too serious, and Vince runs his game with an "old school style" with DM Adjudications, instead of spending time flipping through the book. A Dungeon Master Rules the game, not the other way around when you play, remember that and your games will be 100% better. As of this posting, we have 5 episodes to listen to and you can download it directly by going to Roll High or Die! Website or use one of your favorite podcast app catchers, such as iTunes, Google play or just subscribe on Android!